Dine in style surrounded by local art, which is available for sale. Our wooden tables were handmade by local craftsman Peter Kramer. The bar area offers bar seating, as well as intimate tables for a more casual feel. 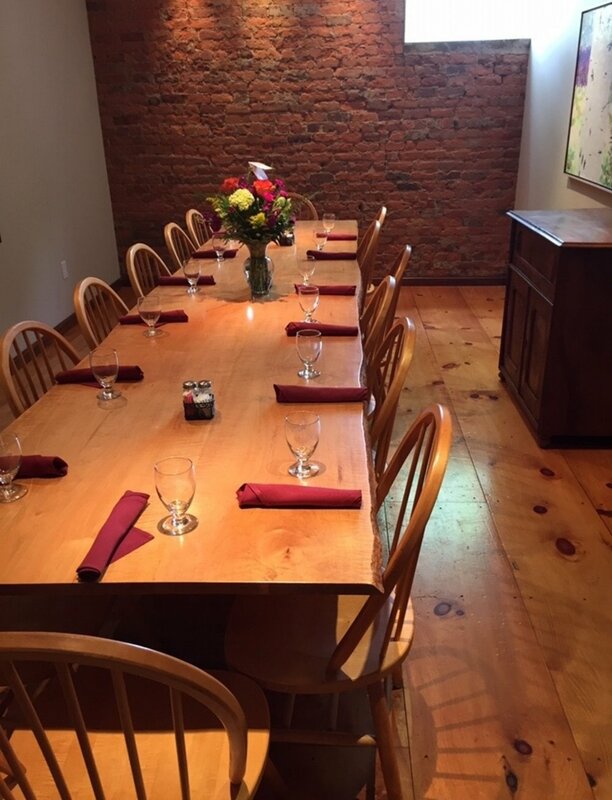 Our private dining room seats up to 20 people around a custom handcrafted wooden table. Please call for details and to schedule your next private event! Our shaded patio is a refined, yet causal place to drink, dine, or simply to surf our guest WiFi. Featuring custom woodwork by local craftsman Peter Kramer and plenty of local art on the walls, our well-stocked bar features a variety of international, domestic, and local beers, wines, and spirits. Prefer to make reservations by phone? Have a special request? Call us at (540) 675.2223 and we will be delighted to speak with you!